The Snickers Gay Kiss has been at the center of an giant learning exercise for Masterfoods USA and advertising agency TBWA\Chiat\Day. The TV ad in contention, After The Kiss, and its online interactive site of the same name, are now officially off air and off line after complaints about the negative behavior associated with gay sexuality. 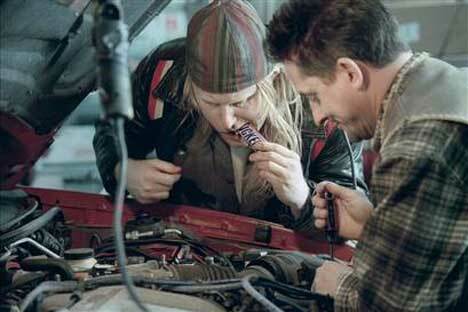 Two car mechanics leaning over an engine find themselves chewing on the opposite ends of a Snickers bar. The experience is so irresistible. They find their lips accidentally meeting as the Snickers bar is devoured. The two mechanics, now insecure about their masculinity, urge each other to ‘do something manly’. Their first attempt has them pulling out their chest hair. In alternative endings posted on the site, www.afterthekiss.com, the mechanics beat each other up and drink windshield washer fluid and motor oil. In another ending a third mechanic asks if there’s room for three on this Love Boat. The interactive site encouraged visitors to vote on the most satisfying ending to be shown during the Daytona 500 later in February. The site included footage of NFL finalists watching the ads with discomfort and distaste. Mars withdrew the ad from public viewing on Monday February 5, less than a day after the Super Bowl, in response to lobbying from gay, lesbian and human rights groups The Human Rights Campaign, AmericaBlog.com, the Matthew Shephard Foundation and the Gay & Lesbian Alliance Against Defamation (GLAAD). The concern from these groups was that this kind of campaign would only exacerbate violence against gays and encourage self harm. www.afterthekiss.com now redirects straight to snickers.com. And the point behind this whole campaign? Snickers is most satisfying. Hmm. In the meantime the conversation continues. The Snickers campaign was developed at TBWA\Chiat\Day, New York by executive creative director Gerry Graf, creative directors Ian Reichenthal and Scott Vitrone, art director Craig Allen, copywriter Eric Kallman, director of broadcast Ozzie Spenningsby and senior agency producer Lora Schulson. Filming was shot by Ulf Johansson via Smith & Jones Films. Editorial work was done at Cosmo Street. VFX were done at The Mill.